Peninsula Entertainment Unit is a functional unit of the finest quality. This Unit features BLUM Tip On push open drawers that effortlessly slide out and the push system eliminates the need for handles whilst also featuring an open section above the drawers. Make your custom order according to the available space after checking the size of the room where you want to place Entertainment unit. Customized size of Entertainment unit will be installed perfectly at your decided space. We at J R Bespoke Designs use best suitable timber material & design shape of Entertainment unit in accordance with your existing interior. 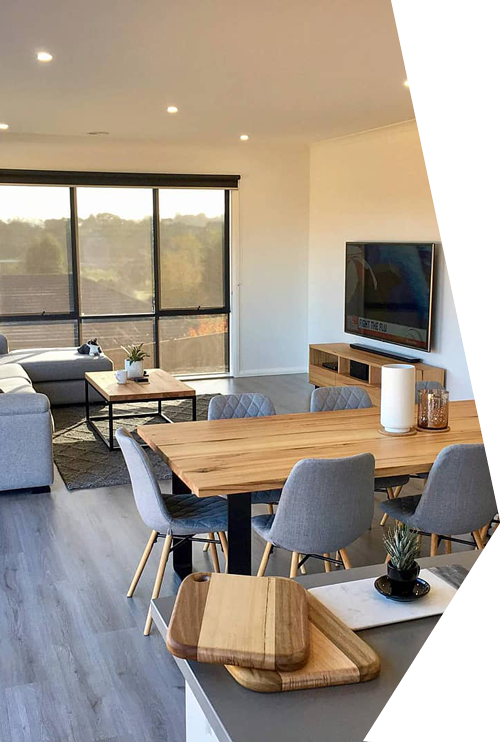 We offer wide range of Custom Made Furniture, Large Dining Tables, Custom Made Tables, Solid Timber Entertainment Units & TV Entertainment Cabinets. We deliver custom furniture in Kew, Ivanhoe, Hawthorn, Balwyn, Eltham, Melbourne, Sydney, Brisbane, Gold Coast, Adelaide & surrounding area.